Have you heard of agile software development? Yes, exactly! The agile marketing approach is inspired by it. An agile marketing approach is a potential approach in which teams focus on significant projects first, completion of those projects with team efforts, analyzing and calculating their impact, and then rectifing the mistakes and increasing the outcome in a continuous manner. It is a clear and precise process-driven way of marketing. It concerns on the delivery of transparent communication, successful collaborations and the experience and knowledge sharing phenomenon. This approach is one of the reasons for the success of many businesses. So in this article, let us analyze it. Agile marketing mainly focuses on improving the four areas of the Marketing function – speed, liability, transparency and flexibility. According to reports by Workfront, 80% of marketers have to face workload, with most of their departments being understaffed. Also, the reports state that Stress level among marketers is in the ratio of 1:4. Thus, Marketing is made easier and simpler. Products are reaching out users in a hustle. If agile marketing is employed along with digital marketing, marketers would be benefitted like never before. Not only MNCs but also small-scale industries and startups will find agile marketing principles adaptable and compatible. 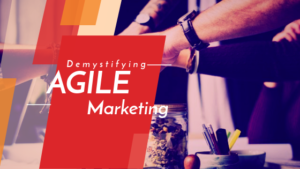 Forbes reported that 27% of marketing campaigns and above 90% of CMOs are benefitted and feel that agile marketing has increased the pace at which their tasks are carried out. Also, 28% of senior marketers feel that project completion rate has rapidly increased, on the usage of Agile marketing. Wrike also pointed out that, 13% of marketers reported that most common issues such as roadblocks are sorted out faster and solved. Agile marketing most importantly constitutes 2 factors – remarkable customer experiences and adapting and flexibility to changes. These 2 are the factors that make it unique and stand out of crowd among several other management mechanisms. Agile marketing is known for its exclusive principles that make it unique and flexible among marketers. The 6 basic principles which mark agile marketing is given in this article. Dynamic to change- this is what the agile marketing mainly focuses on. Adaptability and flexibility are the main demands of marketers as well as customers. In this competitive environment, marketers have to keep updating themselves to changes in trends. Agile marketing is the prodigy behind this adaptability to changes. This will definitely lead to new opportunities for agile marketers. Like agile software development, the main objective of Agile marketing is customer interaction and satisfaction. With the ever-growing demands of customers, customer expectation is something that cannot be denied. Marketing is all about interactive customer experiences in this digital era. Marketing strategies such as agile marketing will lead to remarkable experiences to customers. This is the basis of agile marketing. All other processes follow behind it. As we have already mentioned, customer interactions and understanding their expectations plays a vital role in agile marketing. Interacting with customers and knowing their demand will prove more than useful. Also, interactions among team members will lead to employee satisfaction. Thus interactions can pave way for remarkable collaborations between marketing and customers of an organization. There are many CRM tools available for better interaction nowadays. Social Media such as Facebook, LinkedIn, and Twitter also provides separate platforms for Customer relationships management (CRM). This fast-paced Agile marketing strategy also allows companies to have wonderful customer collaborations. It will help companies in the long run. According to Aberdeen Research reports, companies which employ agile marketing and other best strategies enjoys on an average of 20% hike in its yearly revenue. Thus customer collaboration will lead to more successful ventures. Data analysis is one of the most value area to the marketers. Through data mining we can discover new opportunities from unorganized information. Using data mining and analysis, we can offer personalization and cater to the customer needs. Marketing is not completely about science but data helps mark the milestones in this field. Also, data testing provides us the confidence to try out new ideas by backing our hypothesis with numbers. In Agile Marketing companies often carry out small experiments to test their products. This helps them analyze the pros and cons of their products before going all out with the idea. Starting out from smaller projects to bigger investments helps marketers try out different approaches to identify the best fit. Also, companies will be able to make sure that their concepts are right. Transparency among product developers and the team is a must. Openness to address issues and immediately discuss it, clearly discussing the idea and the concept behind the product is inevitable to the team. Thus providing solutions become less complex, since teamwork pays more. Maintaining transparency is one of the biggest challenges faced by the organization. Hence, it is better to address it in a more casual manner without over-complicating it. Openly discussing the range of product ideas is best approach as it ensures that the team efforts lead to great success. It will ensure rectification of mistakes done in the next version of the product. Also, it will pace up to the customer experience and satisfaction level. In agile marketing, working as a team will always ensure that the product delivery is done in a smoother manner. Marketing is not a separate branch. There are several areas in it. If we see digital marketing, there are SEO, Content development, social media marketing, email marketing and so on. Mostly, there are separate teams handling it under different team leaders. The uniqueness of agile marketing lies in the fact that it leads to a better collaboration and team efforts of different sectors of marketing. Thus with efforts of various members of the team, it would become possible to deliver the product in an efficient market. Employing agile marketing strategies will ensure great success as a team. Customer feedback is a must to evaluate the quality and the reputation of the product. By implementing the principles of agile marketing, direct company to customer interaction is possible. If the customer feedback is received, the strength and weakness of the product can be identified. This will also help out in setting benchmarks (setting up the role model- in most cases, the competitor). Comparison of products will help in improvising the products. As we previously stated, not just for MNCs or Tech giants, Agile marketing is very much vital for startups. Startups nowadays are unique and with a perfect concept and sketch like plans. With Agile marketing, they can reach the next level of growth within a short span of time. Carsurfing, a mobile app based car ride startup, is using Agile Marketing. Ben Watson, who is the marketing advisor of Carsurfing and such startups says that they are into agile marketing process by implementing a combination of marketing, technology, and the creative process into a single set of iteration. He also stated that they are building the look and feel of the website, the customer journey and translating their knowledge of persona and the concept into the product design and description at a time. Marketing demands a lot. Agile marketing will serve all the needs of customers as well as marketers. Thus, it would be appropriate to say that, Agile marketing is the next generation of marketing. With its customer-friendly marketing strategies, it would be easier for marketers to analyze and adapt themselves to the latest trends and needs of customers.